Bol. Soc. Bot. Mexico 19: 19. 1956. TYPE: Mexico. Chiapas; Mun. 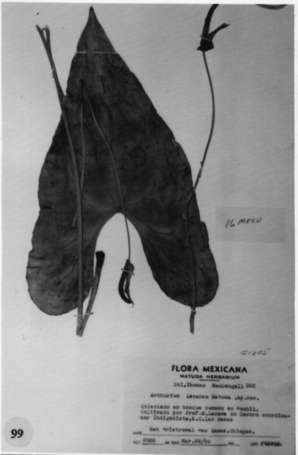 Bochil, Bochil (cultivated in San Cristobal de Las Casas), MacDougall 362 (originally collected by W. Lezama) (MEXU, holotype). Terrestrial; the stems short, 1.5 cm diam., internodes very close; cataphylls thin, 5-7 cm long, drying reddish-brown, soon weathering at least at base into thin, mostly longitudinally oriented fibers. LEAVES with petioles 17-41 cm long, 2-4 mm diam., terete; geniculum 1-1.5 cm long; blades ovate to ovate-triangular, gradually acuminate at apex, deeply lobed at base, 13-28 cm long, 9-18.5 cm wide, broadest at the middle or at the base, the margin slightly hyaline (on drying), weakly revolute; anterior lobe 12.5-20.5 cm long, the margin almost straight to broadly rounded, (sometimes somewhat bulged at base of lobe), the margins sometimes somewhat variable with one margin slightly convex, the other slightly concave; the posterior lobes directed downward or slightly outward, 6-11.5 cm long, 3.5-6.5 cm wide; the sinus usually obovate, rarely parabolic, rounded or obtuse at apex; the upper surface with the epidermis drying with a characteristically raised, alveolate reticulation (papillate when fresh), the lower surface drying more or less smooth; the midrib raised on both surfaces; basal veins 4-5(6) pairs raised on both surfaces, the third and fourth (fifth) coalesced 4.5-6 cm, all but the uppermost arcuate-ascending, joining the margin, the second basal vein joining the margin well above the sinus and sometimes well above the middle of the blade; the primary lateral veins 2-3 per side, usually scarcely apparent, departing the midrib at 70°-80° angle, sometimes curving laterally at almost a 90° angle to the midrib, prominulous above and below, scarcely or not at all more prominent than the interprimary veins or tertiary veins; the tertiary veins weakly raised above and below; the collective vein arising from the uppermost basal vein, 5-13 mm from the margin, weakly raised on both surfaces. INFLORESCENCE usually held erect, well above the leaves; peduncles 37-78 cm long, 3-4 mm diam., longer than the petioles; spathe weakly coriaceous, green, lanceolate to oblong-lanceolate, 3.7-6.5 cm long, 7-14 mm wide, broadest just above the base or at the middle, acuminate at apex, weakly cordate and somewhat clasping at base, inserted at a 45° angle on the peduncle; stipe 2-4 mm long in front, 1-3 mm long in back; spadix greenish, 4-6.5 cm long, 5-6 mm diam. at base, 3-4 mm diam. At apex, held at 180° angle from peduncle; flowers rhombic, 3-4 mm long, (dry) 2.5-2.8 mm wide, (dry) the sides straight, parallel to spiral, gradually sigmoid perpendicular to the spiral; 4-6 flowers visible in the principal spiral, 3-4 flowers visible in the alternate spiral; tepals weakly glossy, minutely and densely punctate, lateral tepals 1.8-2 mm wide, the inner margin very broadly rounded, the alternate pair with inner margins straight to concave; pistil greenish, not emergent; stigma ca. 1 mm long, linear; stamens emerging promptly, from the base, the lateral stamens preceding the third and fourth stamens by only a few spirals, held just above the tepals in a close circle around the stigma; anthers 0.5 mm long, 0.7 mm wide; thecae semicircular, flat, not at all divaricate. INFRUCTESCENCE not seen. Figs. 99 and 100. Anthurium lezamae is endemic to Mexico, in northern Chiapas at 900 to 1,500 m elevation. It is known from the municipios of Bochil, El Basque, and Ocosingo. The plants grow on usually steep, rocky slopes in pine-oak forest in seasonally dry areas. A specimen from adjacent Oaxaca (Schultes & Reko 867, ECON) is possibly also this species but it has a broader spathe and lacks the typically alveolate epidermal pattern on the upper blade surface. The species is a member of section Cardiolonchium and is recognized by its narrowly ovate-cordate leaf blades with the poorly developed primary lateral veins scarcely more prominent than the interprimary veins and the tertiary veins. Also characteristic is the unusual reticulation created by the epidermal cells on drying. The species is perhaps most closely related to (and possibly inseparable from) A. leuconeurum, which differs in having the midrib and basal veins (and the area immediately adjacent to them) much paler than the rest of the blade surface. In addition, the blade surface of A. leuconeurum dries obviously papillate with the individual papillae distinguishable, whereas A. lezamae dries with the epidermal cells drying minutely alveolate (honey-combed). Unfortunately, A. lezamae has not been studied alive so I do not understand the significance of these differences. 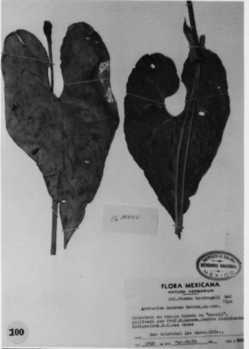 MacDougall 302 and two unnumbered MacDougall collections from an area believed to be southwestern Oaxaca (between La Gloria and Río Grande and between Buena Vista and La Gloria) differ from A. lezamae only slightly in leaf shape but lack the alveolate epidermal pattern on the leaves typical of that species. It is possible that these represent a distinct species but too little is known about them to be certain. Mexico Chiapas: Mpo. La Trinitaria, 1170 m,, , Breedlove 56236 (CAS). Mexico Oaxaca: Mpo. Comaltepec, 1200 m, 17.45N 96.30W, 20 Nov. 1989, Luna 552 (MO). Mexico Oaxaca: Dtto. Choapam, Cerro Caracol, 1500-1750 m,, , Schultes & Reko 867 (ECON).